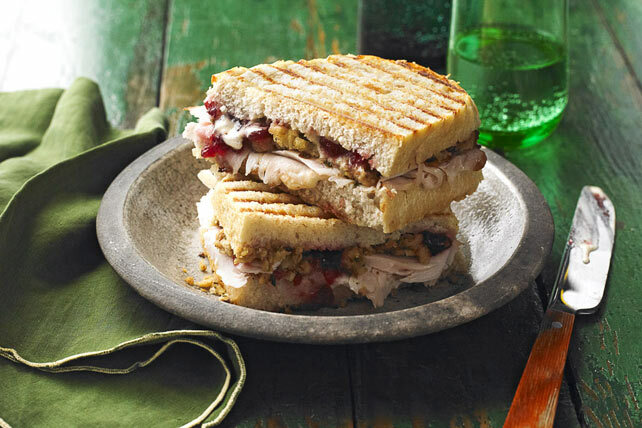 If you thought your turkey dinner was great, wait until you try this turkey sandwich: leftover turkey, gravy, stuffing and cranberry sauce in a toasted panini. Mix gravy and Miracle Whip; spread onto bread slices. Fill with turkey, stuffing and cranberry sauce. Spray grill with cooking spray. Grill sandwich 3 to 4 min. or until golden brown. Heat nonstick skillet on medium heat. Add sandwich; cook 3 min. on each side or until sandwich is golden brown on both sides, gently pressing down top of sandwich with spatula to flatten slightly as it cooks.